Who Remembers Their First Gaming Experience? This Tuesday was a very important day. It was the first day my 1 and a-half-year-old son played his first video game. The game? Wii Sports baseball. And by playing he held the Wii Remote and kinda swung his arm. My older son doesn't really play that many video games — instead, he likes to fold paper and play with LEGO. 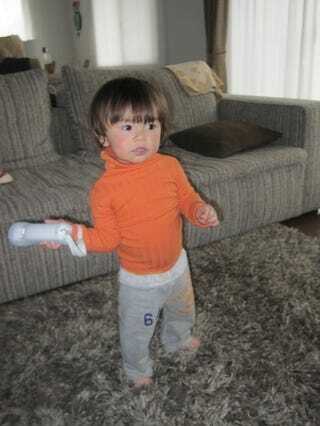 But when he does, Wii Sports is something he likes to play. And now something he can play with his little brother. Say what you will about the Wii. When you're a 1 year-old, flailing about makes for a delightful gaming experience. Watching your child fail about with a Wii Remote, even more so. I don't really remember my first gaming experience. As a kid, I do remember the Magnavox Odyssey and Pong. My cousin had an Atari 2600, and I still have very vivid memories playing that. But I don't quite remember which was first. You know, that exact moment in which I became exposed to video games. I'll never forget, though, when my youngest son did.